Yup, I was that woman in the quote above. I thought I was a straight up bad a$$ for not requiring validation. When you grow up in a family who's incapable of providing positive affirmation or validating your worth you learn to cope in one of two ways: 1) you seek affirmation with a fierce hunger or 2) you live life on your terms without needing validation from anyone. I veered toward the latter. Had I fallen for the former my need for validation would have been debilitating, preventing my photography business from flourishing or squashing the courage to publish my writing when my editor invited me to. I've grown deaf to anything my family says, negative or positive, and I couldn't care less for their approval. Operating in this way liberates me, allowing space for learning how to take my failures and turn them into positive outcomes. I've watched seekers of validation paralyzed with a lethal dose of self-doubt and fear that they couldn't leap with faith over the chasm toward their dreams. Dream killer. 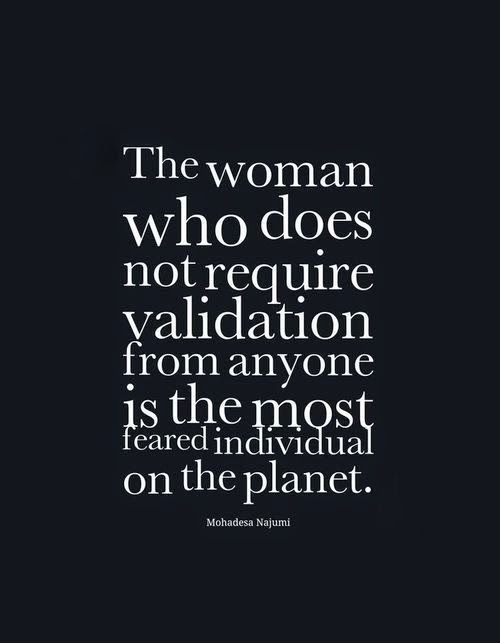 That's what I dubbed the need for validation and really, who needs that? Not I, I told myself with a smug pat on the back. As I chugged along in life people hopped on board pulling on the brakes to slow my roll. I ignored a few but there was one who grabbed my attention letting me know my way wasn't always the right highway. I don't know how many times Ray tried to tell me that I didn't know how to say thank you or show my appreciation. To say I was offended was an understatement. How can he NOT know? You didn't even say thank you. A simple thank you would suffice. You don't appreciate what I do. My lack of requiring validation has handicapped my ability for affirming others. By others I mean loved ones. I assumed my actions, not my words, expressed gratitude and appreciation. But in recent enlightened years I realized a simple thank you really does impact deeply. I owe that enlightenment to the people in my life who are proficient at doling out words of affirmation. They are my teachers. Last March the organization I volunteer for, My Refuge House, held their annual benefit fundraiser and I was invited by the former Executive Director, Crystal Sprague, to photograph the event. Crystal is more of a good friend than "someone I work with." 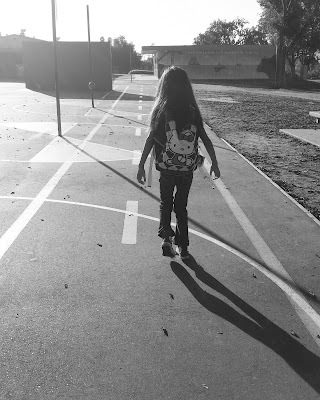 Her heart for the marginalized, abused, and exploited resonates with my own so that we've intertwined throughout the years. When I do the things I love using the gifts God placed in my hands to make this world a better place an unmitigated fervor drives me like a fiery engine. Time isn't wasted with my need for affirmation or validation for my work. A quiet joy rests inside me knowing my work, however small, serves and helps others. It would be remiss of me if I didn't tell you I was plagued with self-doubt or torment wondering if my work was good enough. Am I making a difference? Could I be doing more? I wish I didn't have to work at the cube farm so I can do something meaningful. How can I quit my full-time job? Then what? I'm not trained as a social worker. But I know these thoughts kill dreams too. I continue to volunteer in the fight against human trafficking because it's what I'm called to do. Period. 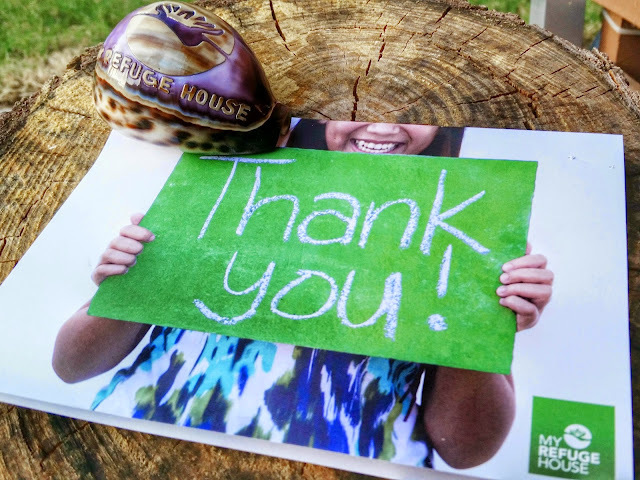 After photographing the My Refuge House benefit fundraiser last March Crystal handed me a gift bag containing the shell and card pictured below. I didn't open it until I got home but as I drove away from the venue I felt the familiar fullness of contentment that comes after I've served others. I felt grateful for being part of something bigger than me. Crystal's words penned in the thank-you note made me pause in wonder. For there in the card were sentences strung up with words of affirmation and validation which I didn't know I needed to hear. Since receiving Crystal's thank-you card the deafening roar of self-doubt is now an inaudible whisper. Tucked into my Filofax I carry the card with me as a daily reminder to give words of affirmation and validate those close to me. I'm grateful for the people (too many to name) in my life who have taught me how to do well in this mode of communication. I'm okay with not hearing words of affirmation or validation for the rest of my life. Crystal's words will last a lifetime.